When it comes to marriage, third times the charm for Linny Taylor. She's thrilled to be on her honeymoon with Jack Avery, Willow Hill's handsome veterinarian. Sweet Southern Hearts is #3 in the Willow Hill series by Susan Schild. Linny and Jack have tied the knot and the great adventure of marriage beckons. Linny has had two previous husbands, (both now deceased) and this one hopefully is going to be third time lucky. The book opens with the two on their honeymoon, engaged in a wild water rafting trip, - Jack's choice! Linny just hangs on, but it is kind of exhilarating for her too. It turns out this is a kind of a metaphor for that first year of marriage as while there are some quiet patches in it, they sure hit a lot of rapids as well. Linny is a bit of a people pleaser, dutiful and responsible. It's not long before things begin to mount up for her. Her business needs her attention, her mother is throwing a hissy fit over a trip she had previously wanted to go on and now has cold feet. Her stepson Neal is a two-timer, sometimes adorable and sometimes the 'kid from hell'. Jack isn't dealing that well with his ex - who has marriage problems. His boundaries are rather weak. Onto that load a crisis for sister Kate and an unexpected arrival on the doorstep. Quite a lot to deal with. Plus - its that first year of marriage. Jack loves Linny but... at times he annoyed me with his inability to speak up to his ex and his son where he needed to. I wanted to eye him and tell him to man up. He has a treasure - take care of it. As well there is three fun old women - Linny's mother one of them who set out on an RV trip and have a little fun and romance along the way. Life is full of second chances when you go looking. So there needs to be compromise, past life complications have to be dealt with and worked through, resentment might just be beginning to rear its ugly head. As Mary Catherine ( Linny's good friend) says to Linny she needs to "toughen up". Well a white water ride might just do that and I sure was relieved when that ride was completed and there were some very happy and proud 'rafters'. While this is part of a trilogy, this book could easily be read alone. The author deftly catches us up on the previous happenings. 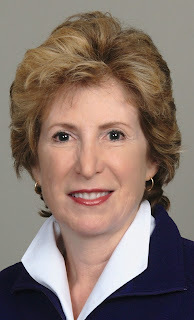 Susan Schild writes wholesome and sunny Southern fiction. She likes stories about charming men, missing money, adventuresome women, sweet dogs, and happily ever afters at any age. Susan is a wife and a stepmother. She enjoys rummaging through thrift store for treasures like four dollar cashmere sweaters and amateur watercolor paintings. Susan has used her professional background as a psychotherapist and a management consultant to add authenticity to her characters. SWEET SOUTHERN HEARTS, the final book in the Willow Hill series, will be released in January of 2017. Readers can look forward to more adventures, new beaus, sinister ministers, lovebirds over fifty, a road trip for Mama and her pals, and maybe even an “I Do”...or two. You can follow Susan on Facebook, Twitter and on her website or subscribe to her quarterly newsletter for inside scoop, sneak peeks and giveaways. 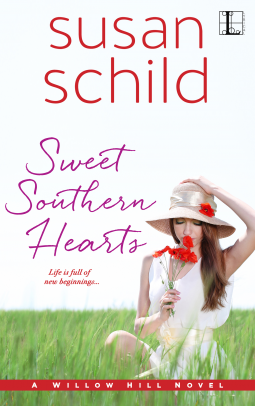 Susan is giving away a $25 Amazon card to celebrate the publishing of Sweet Southern Hearts. Oh what a fabulous cover and great review Kathryn. Have a great weekend! I do love the sound of a sweet Southern read...and, like you, I want to speak up to characters who don't put their exes in their place, and who sometimes let the kids walk all over them. Thank you so much for sharing your lovely review! !